I remember when I was a kid, my brother and I came across this arcade game at our local pizza parlor. Like many arcade games at that time, there was something that would draw players in. The handle bars for a regular ten speed bike stuck right out of the stand up arcade machine. We were sold, quarter after quarter was put into the machine as we waited for our pizza to get cooked. Would there ever be a home version worthy of this arcade classic, only time would tell. The gameplay is what makes this title great. 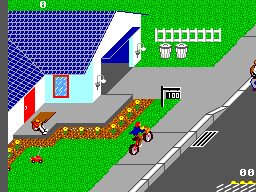 The idea that you are a literal paperboy draws the player in. 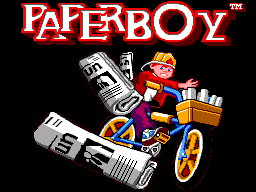 This isn't just any paperboy, he must dodge a series of obstacles along the way. 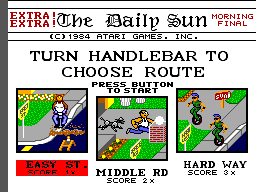 You also get to decided if you are going to be a good paperboy and do your best to deliver the paper to every subscriber. Or break the house windows of nonsubscribers and knock over their trash. You could even be a hero and stop a burglar in the process. Your whole goal is to make it the end of week and with your choices of Easy, Medium and Hard, it makes the player want to come back for more. The graphics are solid for a game made in the 1990's. I had the US version and like most games, it was identical to the Euro version when it came to actual gameplay and graphics. The over head design gives it a real arcade feel, with each stage appearing to be drawn out in a 3-D design. Just like a draftsman drawing a 3-D world on paper. Every thing is to scale evenly. Bright colors and solid drawings of characters give it a great feel. I actual enjoy the music of this game. Much better than many of the other home versions, like the NES. It is very energetic and high beat. My only grip is the number of songs are limited. The sound is solid and you know when you crash, break a window or land that paper into the mail box. The controls are a little stiff. I guess you really feel like you are on a bike and the Sega D-pad is your handle bars. You can speed up or slow down, but there is no stop. So, on coming opponents is something you must plan for quickly for. This all while you are trying to deliver papers. Due to the 3-D world on a 2-D screen, sometime it is difficult to judge where your opponents are a head of you. Also, the speed you travel has a lot to do with timing. Timing the papers into the mailbox or door step is one challenge and moving out of the way of obstacles is another. It actually is what makes the game fun. Although there are times I catch myself swearing at the TV screen because I feel the computer some how cheated me out of a life. After writing this review, I really feel like I need to play some Paperboy. It is something anyone could sit down and do. The game is basic, yet fun. Even if you are a newer gamer, the graphics and gameplay could still get you hooked. It just a classic like may games of that time. If you need a trip down memory lane, this game on the Sega Master System will do it for you. Or, if you are a new gamer and like the classics, this one is for you.